Create exquisite designs and bake shop quality results with Carey's easy-to-follow decorating techniques. Satiny smooth buttercream is the perfect medium for creating decorated cakes that taste as sublime as they look. Buttercream's popularity can be attributed to its simple sweetness, versatility, resiliency and ease of use. 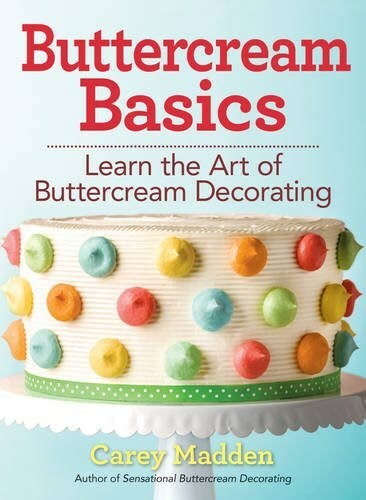 Working with buttercream may seem intimidating, but with Carey's expert and easy-to-understand advice, you'll be creating and decorating stunning cakes in no time. This concise, comprehensive and easy-to-follow guide offers all the information you'll need to get started -- from invaluable instructions on decorating fundamentals and techniques to over 500 step-by-step color photographs. With just a little time and practice you'll soon develop the coordination and muscle memory necessary to decorate beautiful cakes. You can start by making some of the less complicated projects/cakes and then work your way up to more intricate projects once you start to feel confident about your decorating abilities. Soon you'll be able to use Carey's techniques and advice to create your own unique and sensational designs. Full color throughout and mouth-wateringly gorgeous, you'll have 40 projects to choose from and there are even gluten-free and vegan options.